The law requires the use of wheelchair tie down straps or electronic docking systems to keep wheelchair users safe and secure while a handicap van is in motion. With each individual’s specific needs and preferences in mind, we offer several options for manual and electronic wheelchair docking systems. AMS Vans even includes a free set of Q'Straint QRT Max retractable wheelchair tie down straps with every newly modified AMS Vans rear entry handicap van, or New Haven tie downs with all other handicap vans sales. Manual handicap van tie downs resemble seat belts and attach to four different points on the wheelchair, securing to anchors in the floor system of the van. Electronic docking systems lock the wheelchair into place automatically, electronically monitoring the chair during the van's operation. A simple press of the button releases the chair. 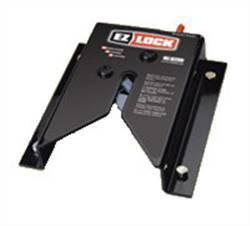 The EZ Lock wheelchair docking system is built with the same goals in mind as the AMS Vans handicap van conversion: to be safe, simple, and strong. If you are looking for the best in wheelchair tie-downs, AMS Vans provides Q'Straint wheelchair tie down straps: the safest, most reliable retractable restraint system available. The M-Series Q Straint wheelchair straps are the budget-minded version of the Q Straint Max wheelchair tie downs. 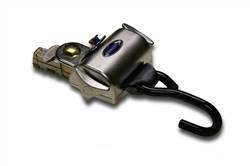 Get the same quality and safety testing done on all tie downs by Q Straint with this lower priced model. 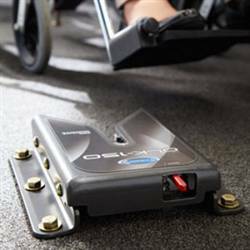 The Q'Straint QLK-150 Electronic Wheelchair Docking System is an automated, alternative choice to manual tie down straps when securing a wheelchair user inside an accessible vehicle. 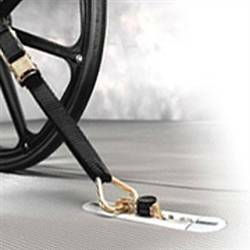 AMS Vans offers wheelchair tie downs for any budget, from manual tie down straps, to self-retracting Q'Straint wheelchair tie down straps and electronic wheelchair docking stations. You may upgrade your wheelchair van to use the EZ Lock Electronic Wheelchair Docking System, depending on your wheelchair. 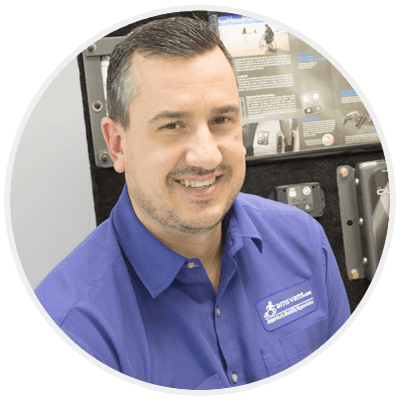 Our mobility consultants will gladly answer your questions about wheelchair tie down straps and electronic wheelchair docking systems.